Can you believe this is for real? What a great Valentine’s Day present! I received my copy today and literally squealed. LOL! When I saw the revision up for pre-order on Amazon in March 2011 I didn’t even hesitate to reserve my copy. Now for those of you who may not know the history, this was an out of print book which is so legendary that the originals were going on eBay for obscene prices. There were rumors for years of a revised edition being published but it never materialized. Knowing all this, I placed my order with hope it would happen this time but not holding my breath, if you know what I mean. Well, it is finally a reality. I am looking forward to spending the evening thumbing through the pages. 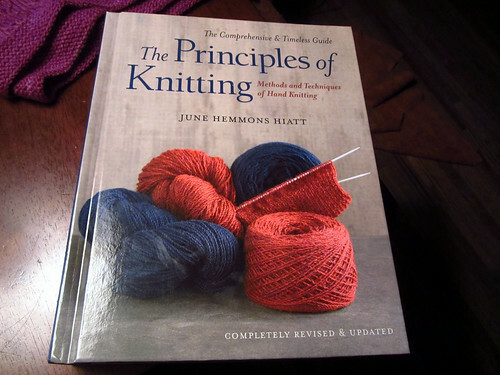 I bet this will become my new go-to reference book, and a nice companion to my trusty copy of Vogue Knitting. Oh, look there! My Sweet Tea scarf is all done! I finished it in Pittsburgh. These loop scarves are certainly growing on me lately. I got it all washed up and blocked, but this is the best shot I could manage of it today. It was gray and drizzly all day. I cast on last night for the matching Slouch Hat in hopes that it will work for me. Fingers crossed. Speaking of bad weather and Pittsburgh…it did end up snowing all Saturday. Ugh! Am I the only one who thinks it is ironic that the ONE weekend I needed to be on the road during this mild and snow-free winter is the SAME weekend that winter decided to rear it’s ugly head? I think about 3-4” fell in Pittsburgh and it even snowed a little here in Nashville. It got VERY cold too, which was pretty miserable since we are not accustomed to it. Despite all that we did have a lovely time at the festival, due to the good company and knitters who braved the elements to come out. Thank you! Speaking of new; here is a sneak preview of a new designer whose patterns we will be carrying at festivals, who also happens to be my lovely and talented daughter, Heather Alwood of Alwood Design. 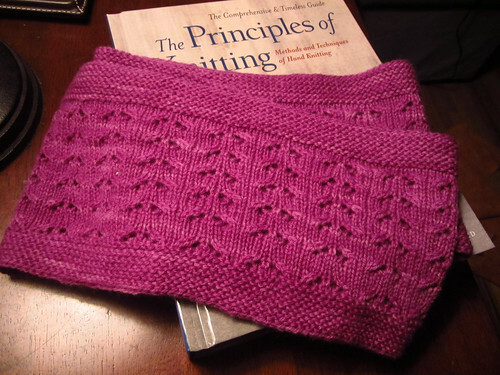 This is a loop scarf that she designed using my Classic Merino Superwash Sock in the Malignant Narcissism color. This arrived while I was in Pittsburgh and I love it so much that I wore it all day today. 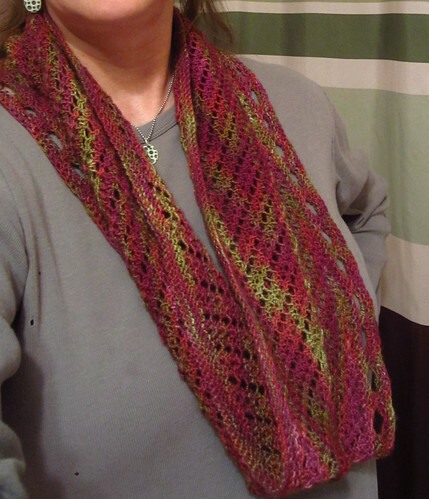 I will link you up and give you more details as soon as she has the pattern ready. I can’t wait to show you the other shawls she knit up for us, as soon as we get enough good light to do a proper photo shoot. They are so pretty!! Okay that’s gonna have to tide you over for now. More details on my next post!